Air raid on Ipswich and Bury St. Edmunds; no loss of life. The Times Red Cross Fund, £1,208,242. The National Relief Fund, £5,026,000. The Queen’s Fund, £153,196. Battle on the Plain of Troy; advance of the French. Further progress by the Allies on the Yser. Mr. Lloyd George introduces his proposals as to liquor legislation in the House of Commons. 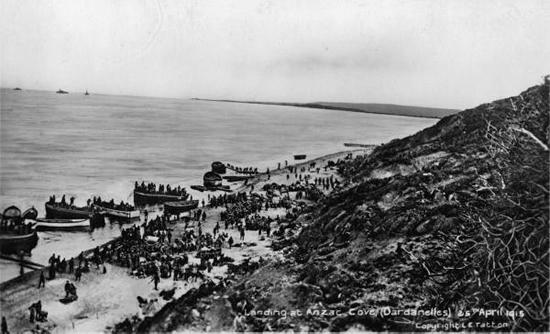 The Allied forces are making good their footing on the Gallipoli Peninsula and the Asiatic side of the Dardanelles. On the Flanders front the Germans are forced back and acting on the defensive. The French armoured cruiser Léon Gambetta torpedoed in the Otranto Straits, 600 officers and men drowned. British take the offensive and make progress, all attacks north-east of Ypres being repulsed. British airmen destroy Courtrai railway junction, and successfully attack the Tourcoing, Roubaix, and other railway lines. The summit of Hartmannsweilerkopf is recaptured by the Germans, and retaken from them by the French. The Allied forces effect a landing on both shores of the Dardanelles. At Ypres the Germans, still using asphyxiating gases, deliver attacks which are repulsed, and the Allies regain ground. The Ypres struggle continues. The Canadian Division recaptures four 4.7 guns and “their gallantry and determination undoubtedly saved the situation.” German attacks at Les Eparges repulsed. The Times publishes documentary proof of an attempt by Herr Ballin, the German Emperor’s friend, to influence British public opinion through The Times on the eve of the war. The document also convicts Herr Ballin of falsely repudiating his own telegram. The enemy develops an attack on the French troops on our left, the north of the Ypres salient. This attack is preceded by a heavy bombardment, the enemy at the same time making use of a large number of appliances for the production of asphyxiating gases. The French have to retire from the gas zone. Overwhelmed by the fumes, they fall back to the Canal. French progress south of St. Mihiel. Extremely violent efforts by the Germans to retake Hill 60. The French line is slightly advanced in the St. Mihiel area. The Chancellor of the Exchequer, speaking in the debate on the output of munitions, says that the Committee of Imperial Defence has always proceeded upon the assumption that the Expeditionary Force would be six divisions. After eight months of war there are more than six times as many men out there. Taking the figure 20 as representing our output of artillery ammunition in September, the output in the succeeding months was:- October, 90; November, 90; December, 156; January 186; February, 256; and March, 388. The production of high explosives has been placed on a footing which relieves us of all anxiety. Enter your email address to follow the Diary and receive notifications of new posts by email.